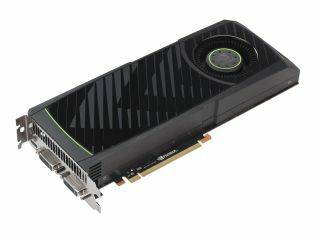 Nvidia has formally announced its GeForce GTX 580 DirectX 11 card - a release designed to counter AMD's recently-released Radeon HD 6870. Read our Nvidia GeForce GTX 580 review now on TechRadar. The card is still based on Nvidia's original DirectX 11 GPU architecture called Fermi, but it fixes the flaws we found with the first-generation card - the GTX 480. The new GTX 580 has a 772Mhz clock and a full 512 processing cores alongside 1.5GB of DDR5 memory. Nvidia is sure not to be too happy over the handling of the announcement - details leaked before the launch courtesy of some of the company's own OEM partners. Nvidia had previously been cagey about its future intentions and we only recently found out that it was planning on releasing this card at this point in time. With this launch, Nvidia is discontinuing the GTX 480 and is putting the new card at the older card's price point and market positioning. You can see what performance the new card puts out in our GTX 580 review, but it certainly seems Nvidia has bitten back at AMD somewhat - after all, the guys in the red corner replaced the HD 5870 with a slower card in the form of the HD 6870. As it always does, this one will run and run.